Transforming how we see the cities around us by forcing us to look at our surroundings – and each other – in new ways, these 5 street art projects are simple yet powerful. 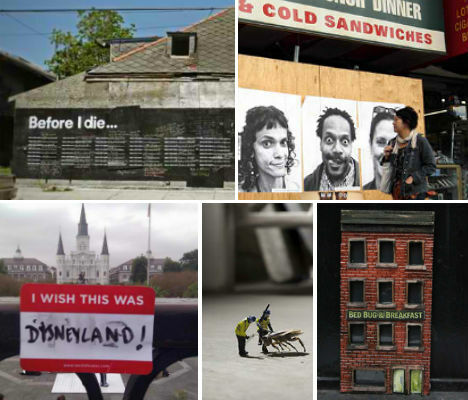 Artists are spreading activism, sharing hopes and dreams, captivating onlookers and engaging the community with visual and often collaborative projects that may seem small, but make a big impact. Is there an abandoned building in your city that you wish could be a new restaurant, or a community gathering spot? Do you gaze out your window at a parking lot and imagine what it would be like if it were a park instead? 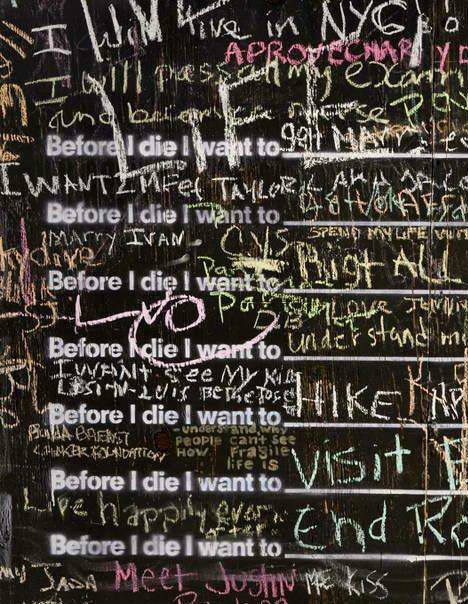 Cindy Chang’s ‘I Wish This Was’ project lets people voice their wishes for their cities, and how they reflect their own needs. 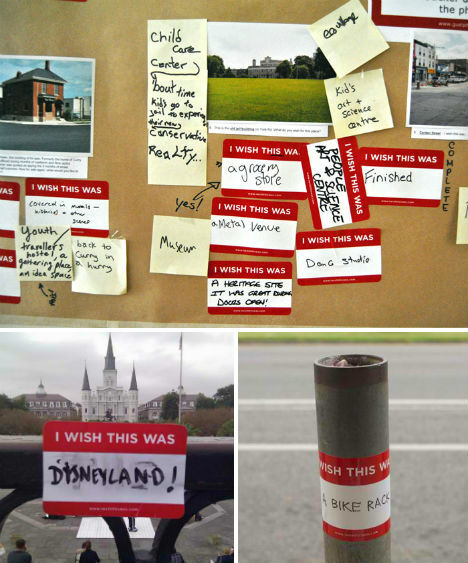 Affixing the easily removable vinyl stickers to windows and other surfaces, participants share an alternate view of their surroundings. Some are realistic – like laundromats or open-air markets – while others are pure fantasy, like inland beaches. Which buildings in New York are infested with teeming colonies of dreaded blood-sucking bed bugs? A hilarious (and helpful) project by artist Hunter Fine gives passersby some inside info by placing tiny hotels on the walls of hotels where bed bugs have been reported. 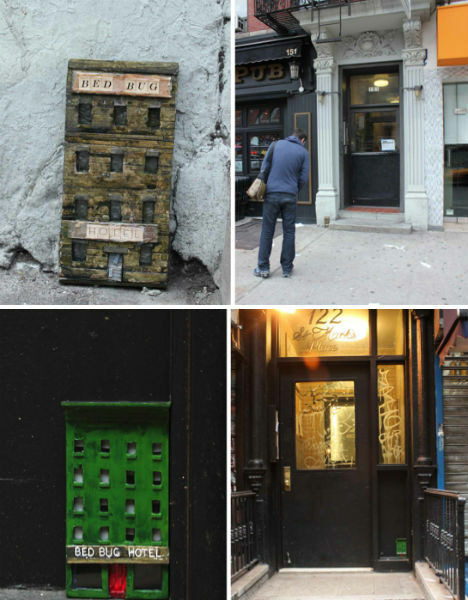 Tiny replicas of building facades emblazoned with the words ‘Bed Bug Hotel’ are affixed to brick, wood, stone and plaster, their faces ranging from respectable-looking establishments to dilapidated hovels. Fine hopes that he installations will force landlords to act on the infestations. 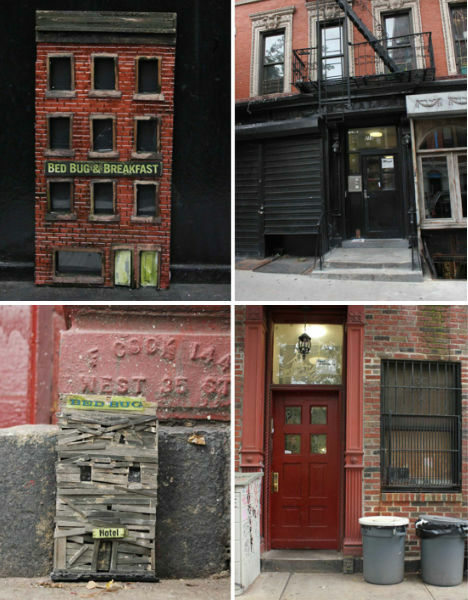 He’s encouraging others to create their own mini hotels and place them on buildings with known bed bug problems, sending him the photos to post to his Tumblr. 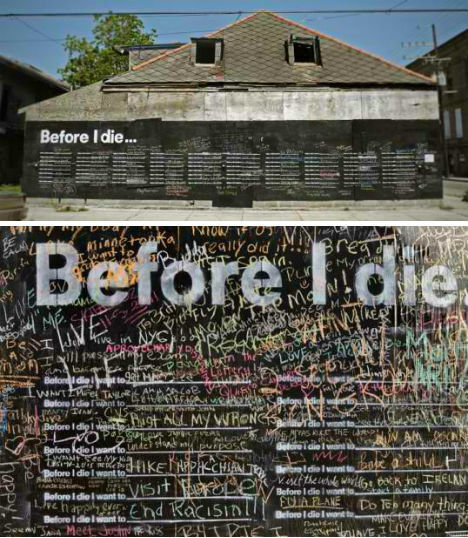 The project has spread beyond Chang’s hometown of New Orleans to Brooklyn, Montreal, Portsmouth in New Hampshire, Queretaro in Mexico and even a youth art camp in Kazakhstan. 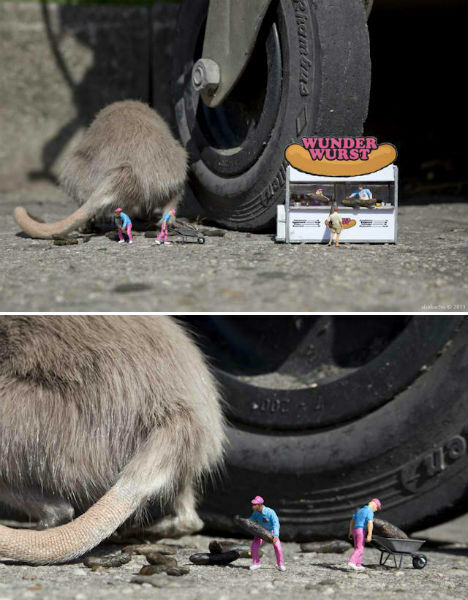 An ongoing project since 2006, the Little People Project by artist ‘Slinkachu’ creates teeny, tiny worlds with miniature figures in full-sized urban settings. So small, they typically go unnoticed by passersby, the images are often strange and funny, making a subtle statement about the many things that we miss as we go about our busy days. 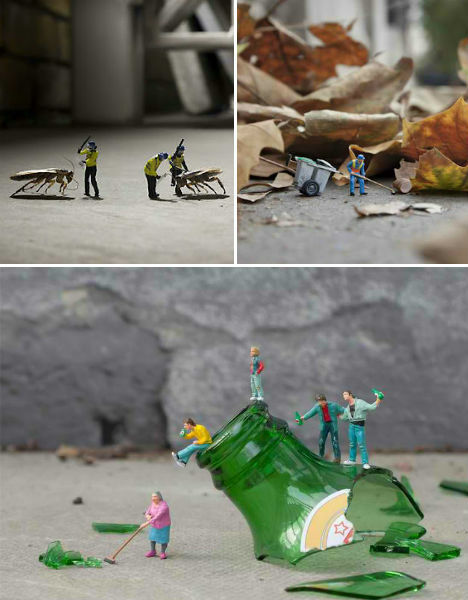 Slinkachu assembles these little scenes with impossibly small figurines, trash, street debris and other objects, often integrating elements of the urban landscape. A fire hydrant is transformed into a temple, and a stripe of white paint on the street turns into a ribbon of snow in a winter wonderland. After photographing them, the artist abandons the figures to their fates, forcing them to make their own way in the big cruel world. 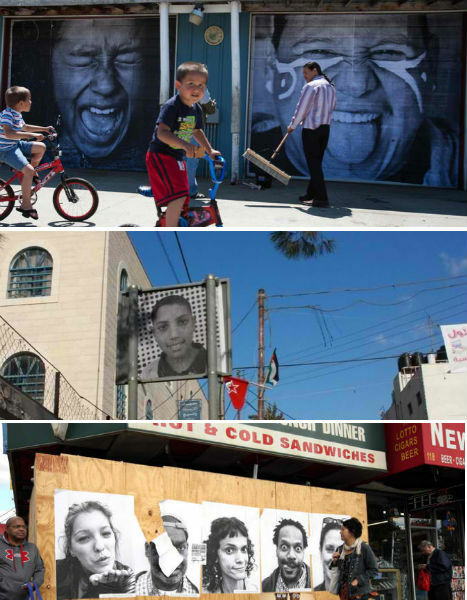 An anonymous winner of the TED Prize known only as JR has sparked a global street art project that turns black and white portraits submitted by the public at InsideOutProject.net into posters that are then sent back to the participants and displayed in their communities. The $100,000 that JR received to fund his or her “wish to change the world” has resulted in thousands of giant posters going up in places like New York City, Juarez, Mexico and Israel. Supporters are donating wall space and other property for the display of the posters, and the images will even be integrated into Google Earth.